Since my first day at the historic temples of Angkor went amazingly, I was extremely eager to start the second day. 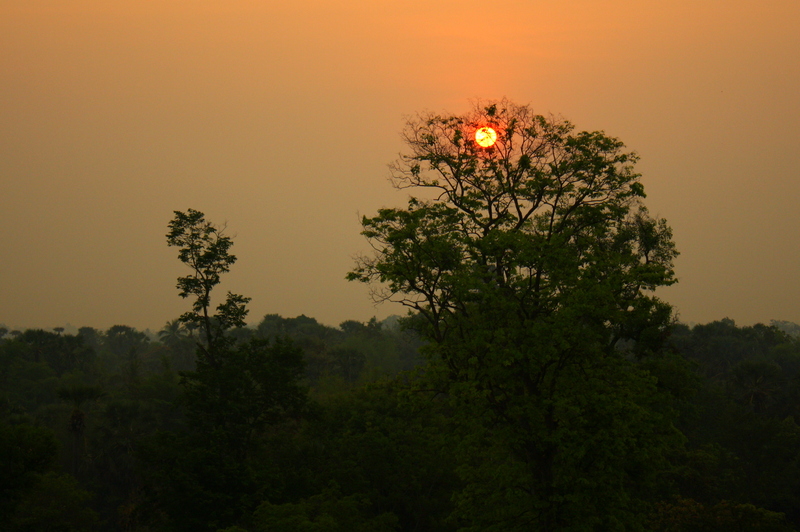 So eager, that I agreed to wake up at 4:30 in the morning and get an early morning start to catch the sunrise at Pre Rup. I figured, I’m here, why waste time sleeping, right? Right. I dragged myself out of bed and met up with three couchsurfers and a tuk tuk driver ready to take us to the faraway temple of Banteay Srei. Honestly, the sunset wasn’t too dramatic. There has been a constant haze around and the sun didn’t appear until the temple was almost completely lit. The warm sunlight brought out the orange in the walls and statues of Pre Rup and it was definitely worth it to get an early start on the day. We experienced more history and culture before most people get out of bed in the morning! 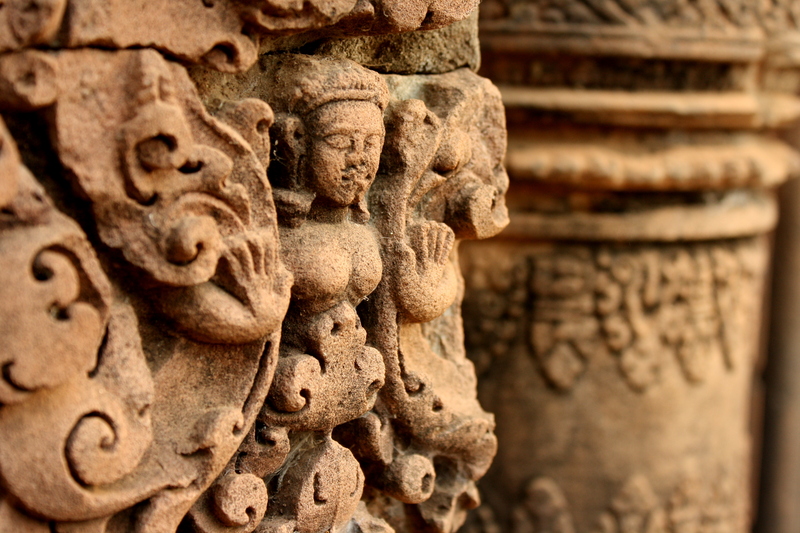 Built in the 10th century, Banteay Srei, or the “Citadel of the Women,” is known for its unique red sandstone and intricate carvings, which were breathtaking and I have to say it was one of my favorite temples so far. Seeing it in the morning light really brought out contours and beautiful redness of all the carvings. There were also some distinctive statues in the main temple which were crosses between monkeys, birds, or lions with humans, something that I hadn’t seen yet. It’s great to see new things from temple to temple because I think it would get a bit repetitive and “temple fatigue” would set in a little quicker. 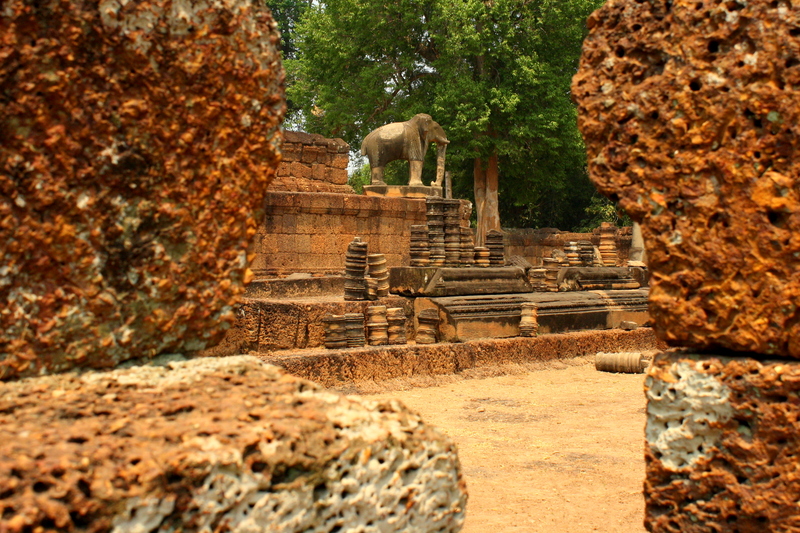 After a peaceful walk through the woods around the temple and a delicious omelet for breakfast, we jumped back into the tuk tuk and headed to Banteay Samre, which was perfect timing, because we just missed the hordes of people coming into Banteay Srei. I really enjoyed this temple. It was extremely compact, but it was covered in wall carvings. There were lots of little corridors and places to climb and explore and we actually almost had the place to ourselves. I love that we are able to climb all over ancient ruins. You would never see that in the States! I get to scale stairs that are crumbling as I write this and its such an amazing feeling. Imagining what it was like in its heyday. All the people bustling around. 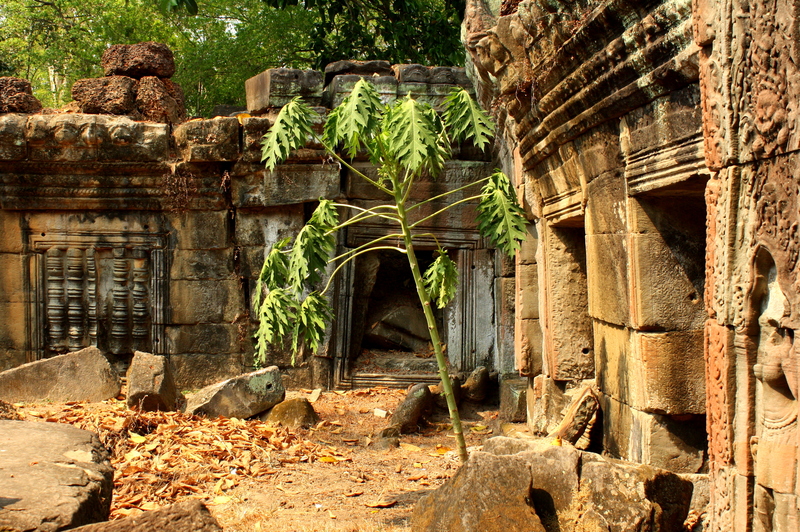 The cities of Angkor Wat and Angkor Thom must have been madhouses! Next, we shot over to Eastern Mebon, where we got a quick look at some large elephant statues, which we haven’t seen anywhere else. They seemed to be in pretty good shape too, which was surprising. Everywhere else, you see the lions faces smashed in, they have only three feet, or no head, but the elephants were solid and seemed untouched. We decided to power through our day so we could end by threeish, so we headed right over to Ta Som. The temple wasn’t anything too special, but it did have a lot of great carvings, dilapidated statues, and rubble to climb around on. The unique Preah Neak Poan was right down the road and offered us something slightly different to look at. The temple was formally an island and is said to represent the Himilayan lake of Anavatapta, a lake known for its miraculous healing powers. It was a circular monument (the island) surrounded by a large square with four smaller squares surrounding it. 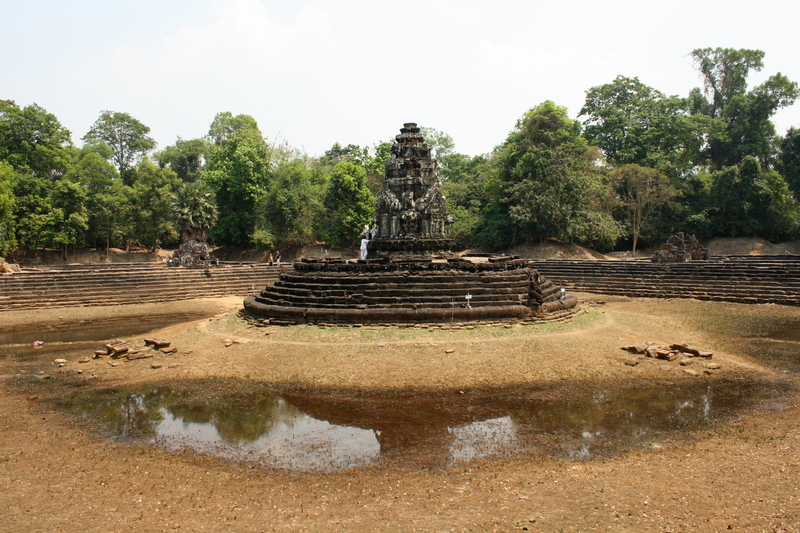 It would have been wonderful to see this in the wet season (like a lot of the temples and things to do in Siem Reap! ), but imagining the water was good enough. Our last stop of the day was at Preah Khan, an enormous complex that seemed to keep going forever! It had trees growing through the walls, rubble in every room, stone blocks of rubble everywhere, and of course, amazing carvings. Those ancient Khmers really knew how to carve stone and the fact the all these carvings are still here today just blows my mind. Most of these carvings are older than America. Actually, scratch that. 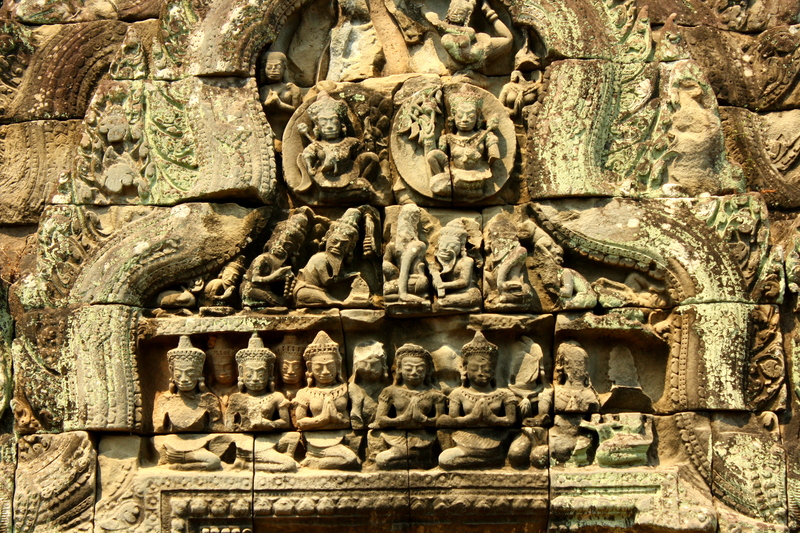 All of these carvings are older than the U.S. So incredible. Another amazing day at the temples completed! I’m definitely up for a break tomorrow though! I see all is still going well! I went to Chichen Itza last year which is also a UNESCO site and you can’t climb on anything or go inside of any of the temples anymore. I was totally disappointed, so don’t get too spoiled where you are.